White Paper Published By: Integration New Media, Inc. 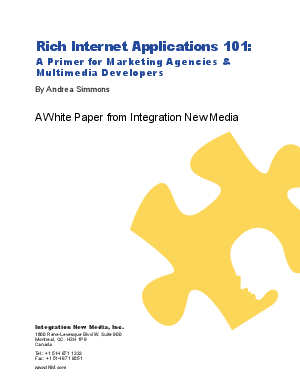 This new white paper by Integration New Media provides marketing agencies and multimedia developers with a strong foundation of information about Rich Internet Applications (RIAs). From basic definitions through to technology explanations, this white paper is a must-read for those looking to embrace new technologies to satisfy their clients’ growing needs.